As the 1965 Formula 1 season drew to a close, it looked to be the end of an era. The small 1.5 litre capacity limit which had been the standard since 1961, was to rise to 3 litres in an effort to bring more power to the formula. Manufacturers were deep in the development of their new offerings, having known of the revised rules since their announcement in 1963. 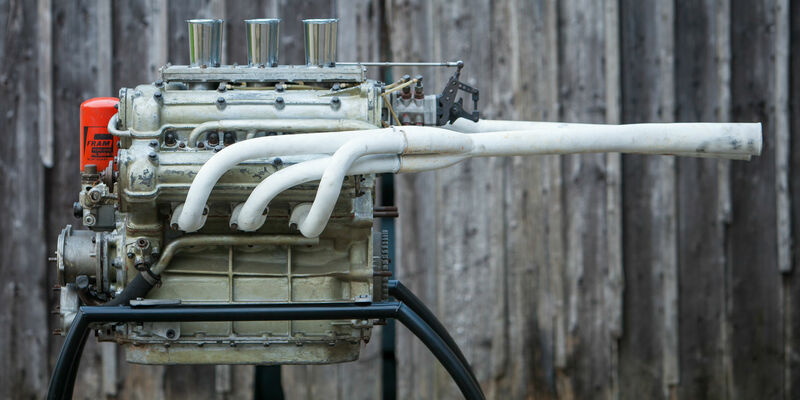 However, by the time Ferrari wheeled out it’s first prototype V12 Type 312 to be presented to the press in December 1965, the likes of BRM and Cosworth were still some way off having their new engines ready to see the light of day. Pleased with their readiness for the new formula, it was decided at Ferrari that a special single seater should be assembled for John Surtees to campaign in the Tasman Series in New Zealand and Australia early in 1966. The chassis of Surtees 158 from 1965, 158-006, was adapted to carry a Dino 246 engine giving around 280 hp within the Tasman Series’ capacity limit of 2.5 litres. A unique layout of Lucas fuel injection was used, with a single throttle slide for both banks and staggered inlet trumpets, and given the designation of Tipo 228. 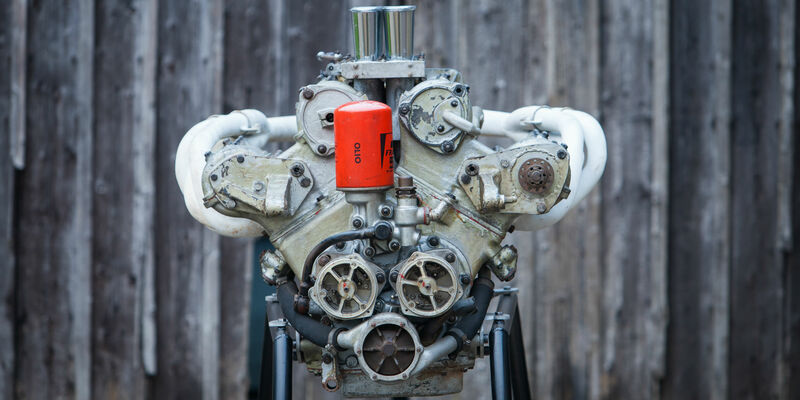 The 228 had a bore and stroke of 85mm x 71mm giving a swept volume of 2417.3cc with two valves per cylinder, a compression ratio of 9.8:1 and featured twin ignition to give peak power at 8,500 rpm. Larger, knock-off rear wheels were fitted but otherwise the car was very similar to it’s previous 1.5 litre form. Before the intended Tasman trip could begin however, Surtees crashed his Can Am Lola heavily at Mosport Park and he subsequently spent the rest of the winter recovering from his injuries in hospital. With the new Formula One season looming, Surtees demonstrated a remarkable amount of determination and a refusal to accept physical defeat and was soon back at Maranello with Ferrari. Surtees remembers Enzo’s reaction fondly; “The Old Man had rung me up after the accident and said ‘John. Which leg is it?’ I told him ‘the left one’ and he replied ‘That’s OK, if necessary we’ll make you an automatic!’”. As the season got underway with the new 3 litre regulations, the little V6 engined 158 provided an excellent second string as the prototype 3 litre V12 312 was used by the now recovered Surtees as team leader. Where handling and low down torque was more important than top end power, the 246 was eminently suitable. At Syracuse for the first European 3-litre F1 event, Bandini qualified the 246 second quickest behind Surtees’ 312. The Italian led briefly and finished second behind his team leader. At Monaco, the Ferrari transporter had been delayed in thick Italian national holiday traffic and the Thursday test had been missed. On Friday morning, Bandini drove the 246, and Surtees in the V12. Surtees was immediately amongst the fastest in the V12 car, and for the final practice session in the afternoon, Ferrari produced a second, brand new, 312 for Bandini. Both 312s were of the same specification, but after practice Bandini decided instead to use the 246 for the race, as with it he had qualified 5th, just 0.6 seconds back from Clark’s pole time. In the race, the Italian was second again after setting a lap record, bettering even Clark’s pole time, while chasing down the leading Jackie Stewart. The nimble and reliable 246 showed it’s worth with an excellent result. At a very wet Spa, Ferrari again took a pair of 312s for Surtees and Bandini, with the 246 present as a reserve. Once more, however, Bandini elected to run the smaller engined 246 for the race and the 312 remained unused. The race on the long legged epic circuit started in the dry, but on the first lap a sudden downpour at Malmedy caught out several of the leading group in a multi car spin, which eliminated many of them from the race. Surtees and Bandini avoided this chaos, and at the end of the second lap the Italian snatched the lead from team leader Surtees. Within a lap, Surtees was back ahead and Bandini went on to take a credible 3rd place finish. By the time the German GP at the Nurburgring came around in August 1966, Surtees had departed Ferrari and was now driving for Cooper. Bandini was promoted to team leader in a 312 and the little 246 was assigned to third driver, Ludovico Scarfiotti. Once more the 246 excelled, with the undulating Nordschleife circuit suiting it’s drivability. Scarfiotti qualified the 246 in 4th, on the front row of the grid, and in fact about one second ahead of both Bandini and Parkes in the two new 312s. In the race, Scarfiotti retired with a battery problem. After the German GP, the 246 was loaned to Giancarlo Baghetti for the Italian GP, who was contracted to the Parnell Racing Team, after his own car had failed. On the long straights of Monza, the best Baghetti could manage in qualifying was 16th, on the seventh row. Baghetti spent a good portion of the race dicing closely with Spence, Arundell, and Anderson before he and the 246 retired on lap 59. By this time the development of the 312 had progressed in such a fashion that the 246 was no longer required, and the car didn’t run in an Grand Prix again. By the 1970’s the 158, still fitted with the 246 engine, had become a feature in the Bardinon collection and then moved to the Setton Collection in France. 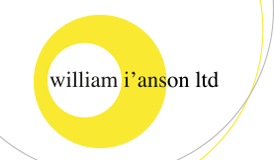 In 1983, the current owner was at the collection with the interest of buying another of the cars. At this time, the 246 engine presented here, was being removed from 158-006, as the car was being put back to 1.5 litre 1965 specification. 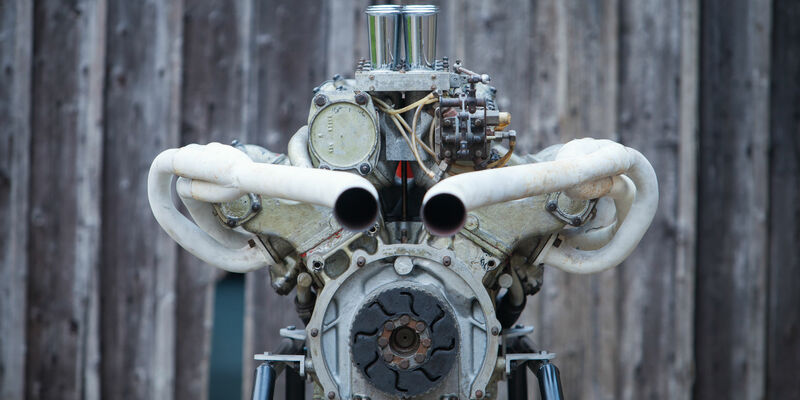 The 246 engine was bought, along with the other car from the Setton Collection and has remained unused and with the current owner ever since. This engine is the very one, removed from Bandini’s Monaco 158 Formula One car, 158-0006 was Ferrari’s first engine iteration for the new enlarged formula. Technically the type number was 228, but it is often referred to as the 246, based largely on a Dino unit. 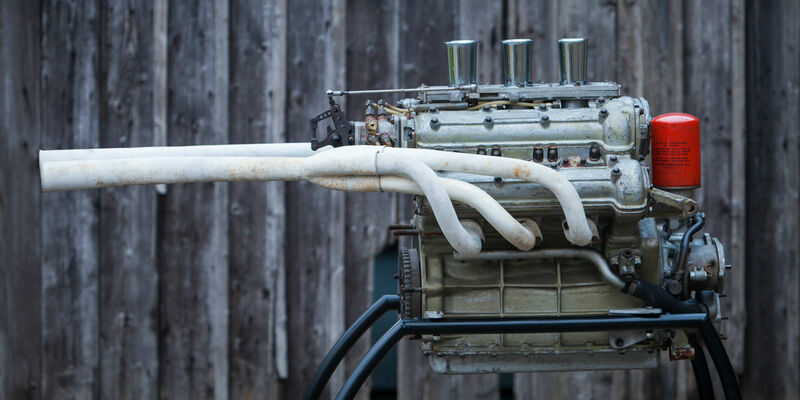 A key piece of Ferrari’s Formula One history, this jewel of an engine is instantly recognisable in period photos thanks to the unique trumpet layout visible extruding from the engine cover. 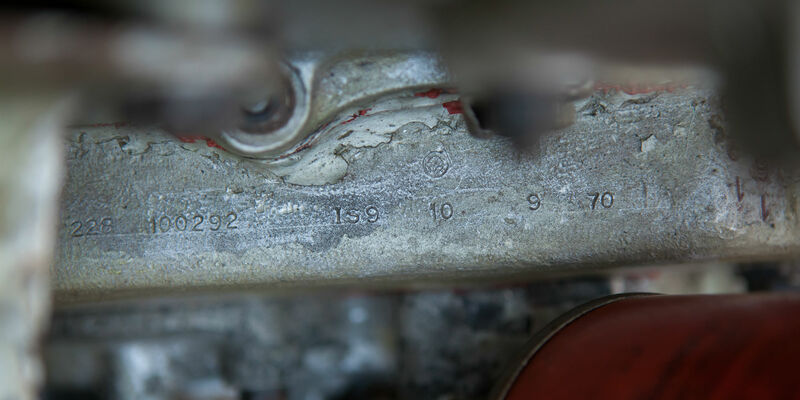 The Tipo 228 presents an opportunity un-heard of in modern times, to acquire an unmolested significant part of Ferrari’s 1966 Formula One story, with it’s stampings clearly visible including ‘228 N.1’. 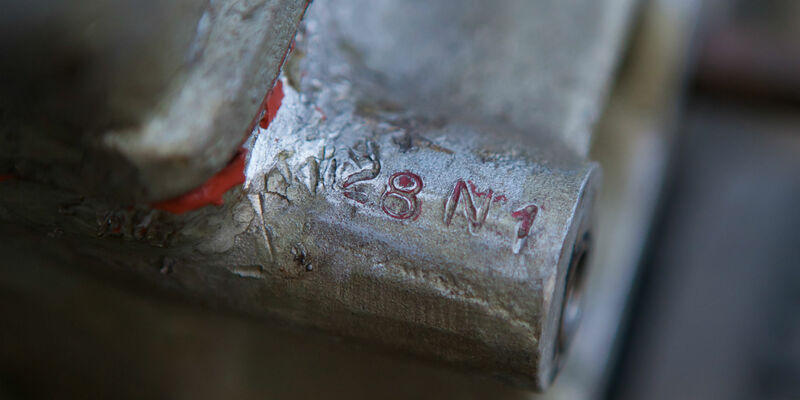 This is an opportunity un-heard of in modern times, the chance to acquire an unmolested significant part of Ferrari’s 1966 Formula One story. Literally taken straight out of the back of 158-006, 36 years ago while in the Seton Collection and presented as you see it today. Built to power Ferrari’s lead driver John Surtees in his 158 chassis 006 for the 1966 Tasman series. 158-006 was driven with great success by Lornezo Bandini in the 1966 Formula 1 season with 2nd at Syracuse, 2nd (with Lap record) in Monaco, 3rd at the Belgium Grand Prix (Spa) and put on the front row of the German Grand Prix on the legendary Nordschleife by Ludovico Scarfiotti. In its current ownership for some 36 years.